Just look at this nonsense. Look at it. The back of a MOTU Ultralite (the original "Mark I" version) over-patched from here until eternity. This is because Mark of the Unicorn (MOTU) makes the "digital mixer" inside their Ultralite box only mix inputs. You can't also mix the so-called "software returns" inside the box. So what have I done here? Routed six analog outputs right back to the analog inputs. The whole purpose of this mess here is to make it so I can monitor a 5.1 surround mix in stereo on headphones. That's the whole thing I'm going through all this rigmarole to do. And I have to make this huge inelegant cable mess just to do it. So right, the only multi-core I have is this nice Canare 8-channel snake with TRS connectors on each end. It's sixteen freaking feet long. For a six-inch jump. Oh but wait. There's more! 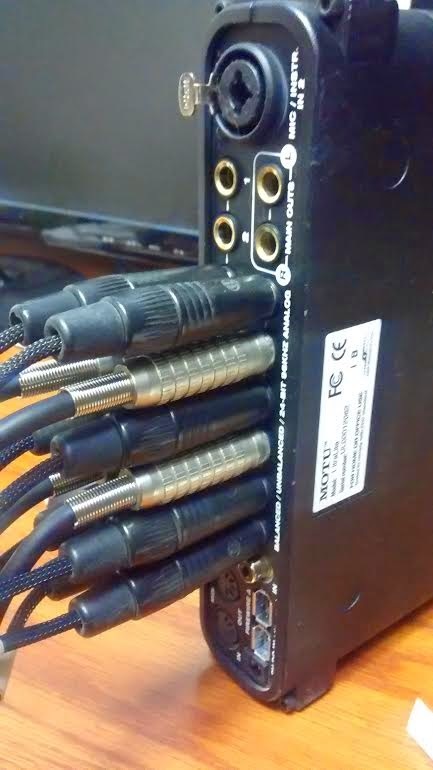 Look carefully at those bottom two connectors. See how they're slightly canted away from one another? Yes! That's because the Neutrik connectors are fatter than the distance between the jacks on the back of the Ultralite. So I used a couple smaller cables with Switchcraft ends (the silver-ish connectors) to try to keep the entire PCB on the MOTU from being split apart simply by having things plugged into it. Am I irked? Yes. Yes I am irked. Do you have any idea what I'm talking about? No. No you do not.